Spartan fans who couldn't make it out to Minneapolis for the Final Four headed to Munn Ice Arena in East Lansing for their watch party. And, the fans felt pretty confident that MSU would take it all the way to the championship on Monday. 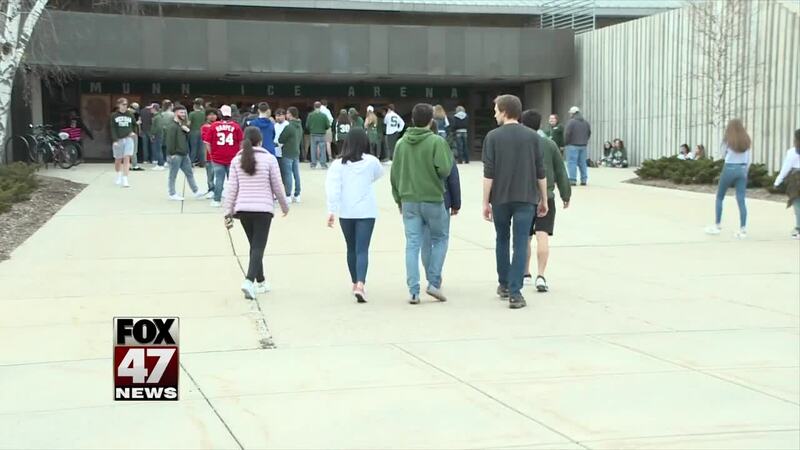 EAST LANSING, Mich. — Spartan fans who couldn't make it out to Minneapolis for the Final Four headed to Munn Ice Arena in East Lansing for their watch party. And, the fans felt pretty confident that MSU would take it all the way to the championship on Monday. Hunter Nelson told FOX 47 News, "I've been a Michigan State fan most of my life so, it's really a great opportunity to watch the team come out, and hopefully get the job done and if everything comes to fruition we should be able to have the championship on Monday." Lydia Erickson said, "Let's celebrate a win or a loss without burning anything, please." The Lansing Police Department told News 10 that they had a plan in place to deal with even the rowdiest of crowds. Dep. Chief Steve Gonzalez of the East Lansing Police said, "We have strategic plans of where we are going to be placing officers. We also have very strategic plans that if something occurs, like fires, how we are going to impact that and insert officers into the crowd, arrest the people that are responsible and disperse the crowd if need be." Leaders from MSU and East Lansing are also urging fans to celebrate safely while cheering the Spartans on.